Ghetto cocktails, dusty murals, and $5 Old Crow—a peek at the revamped Skid Row dive, now open. Remember back in December when King Eddy’s Saloon, one of the oldest bars in Los Angeles, announced it would be closing its doors? Everyone was sad, aghast, and even a-feared that the new owners of the bar, Acme Bar Group (Spring Street, downtown’s Library Bar), would yuppify the beloved dive which sits just on the outskirts of Skid Row and displace its cast of lovable barflies. Well guess what? 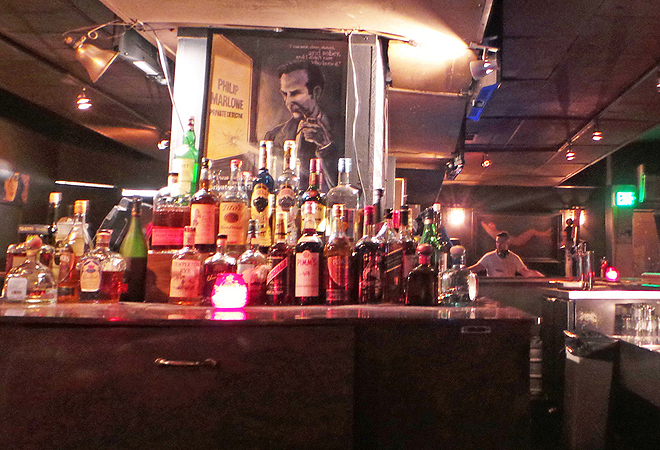 King Eddy has reopened and the barflies have returned despite the changes. The bar has been cleaned up, with its old neon beer signs traded for midcentury-style artwork, and the smoking room has been turned into a dart room. “You used to be able to smoke in here but it was pretty nasty. I didn’t really want to keep that,” says King Eddy’s new co-owner, Jon Valenti. The liquor inventory has been upgraded with the addition of craft beer on tap. But the prices are still affordable. “Probably the cheapest you’re going to find downtown,” Valenti says. “Well is $5. Old Crow whiskey [the well whiskey], you’ll pay $8 for that anywhere else. Jameson here is $6. Usually you pay $8 anywhere else. All our canned beer is $4. Rotating taps of craft beer is $5. We have Stone IPA, Black Market Brown.” I had myself a Macallan 12 Year here for $11. At Seven Grand it goes for $16. There isn’t a cocktail menu yet but Valenti plans on placing one soon. “We’ll do a list of five, what I call, ‘ghetto cocktails,’ but they’ll be specialty cocktails kind of played to this part of downtown. Probably will have something next week,” he says. A peek of the downstairs space in its current state of disarray reveals old murals dating back to who knows when. One is of a bobby (police officer) reprimanding a drunk, while another is of a cottage in the woods. Old, dusty furniture, which Valenti hopes to refinish to be used in the bar, lined its walls but there was no hint of an actual bar structure. ’Til then, grab a stool and toast some Old Crow with barfly/airport worker Val, who’s been patronizing King Eddy since 1968. Or join in a singalong with 30-year veteran bar patrons or even twentysomething art walkers. It’s still that kind of place—except it smells better. Open daily 3 p.m to 2 a.m.